On this day in 1888 in Arles in southern France, Vincent van Gogh performed the most infamous act of self-mutilation in art history. He cut off part of his left ear lobe. From that point on, the world pointed, laughed and called him mad. The ear-slashing episode followed his most frantic period of creative activity. For during 1888 he made some of his most celebrated paintings; paintings which would change the way subsequent artists used colour. These paintings of sunflowers, irises, harvest landscapes, his bedroom, his yellow house, and dozens of portraits, portraits, portraits would become iconic and command many of the highest prices ever paid. Making them earned him not a franc, but cost him his life. 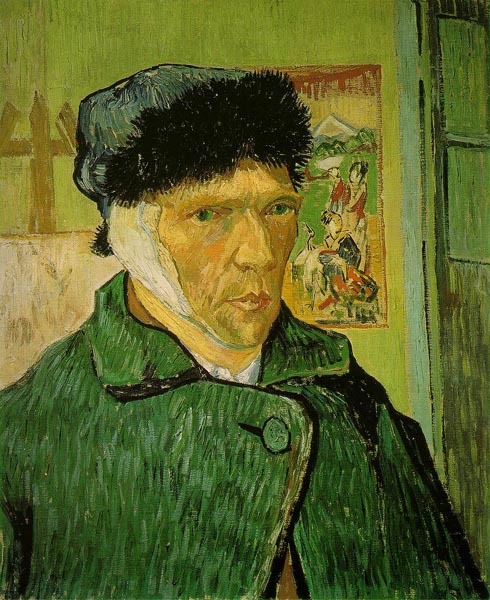 Vincent had a history of self-harm, suffered from bipolar disorder and probably had epilepsy, too, just for good measure. Bipolar disorder is characterised by periods of intense mania, followed by crushing, often self-destructive lows. And one hundred and twenty-two years ago today, Vincent hit rock bottom. Two months earlier, in October 1888, artist Paul Gauguin went to Arles to join Vincent. Vincent was thrilled. They could paint together, and talk about big important artistic ideas. In reality, Gauguin didn’t want to go; but he had nothing better to do and Vincent’s brother Theo – a successful art dealer – had promised to buy any canvases from him of whatever he produced in Arles. Gauguin could hardly refuse. Vincent was a sexually frustrated, stubborn, smelly, dirty, artistically unrecognised, lonely alcoholic; a dirt-poor rebel, shunned by practically everyone but Theo. Gauguin was a confident, already successful artist, attractive to women and with a huge ego. Such different people. It was never going to end well. On the evening of 23rd December, the two artists had been out drinking and whoring. They had a row, over what we don’t know, but it may well have been a woman. Vincent came at Gauguin with an open razor. Gauguin stared him down. Vincent ran away. Frustrated, he turned the razor on himself, cutting off part of his ear lobe. He wrapped the ear fragment and gave it to Rachel, his favourite woman at the brothel. Why? Because in the old Roman arena in the town, Vincent had seen matadors cut off the ear of the bull they had killed, which they later gave to their sweethearts as a symbol of their bravery and manhood. In Arles that’s what you do. The ear-hacking was the logical act of a desperate, frustrated man. Vincent later returned to the yellow house and collapsed, bleeding profusely from the artery he’d severed. The rest of the story is well-known: the asylum and finally suicide. On this day, though, let us not dwell on the madness but consider instead Vincent’s single-minded vision to pursue his art in spite of a world that didn’t give a toss about him, and find inspiration in the exquisite emotionally charged paintings he left us. Vincent is the personification of suffering for one’s art.